Summary: 12-year-old Ebo lives with his alcoholic Uncle Patrick in Ghana; his sister Sisi has left to try to get to Europe. When his brother Kwame also runs away, Ebo decides to try to find him and start a new life in a more prosperous country. The brothers eventually reunite and make their way across the Sahara Desert to Tripoli, Libya. From there, they work and save money to take a boat across the Mediterranean Sea. The story is told in chapters alternating between that boat journey and flashbacks relating the events leading up to it. There is extreme hardship, illness, and death every step of the way with a particularly heartbreaking tragedy at the end. Ebo is persistent and optimistic, though, and his prospects for success in his new country seem promising. Includes a map; a creators’ note that tells more about refugees; and “Helen’s Story”, the story of a Sudanese woman’s harrowing journey to the United Kingdom. 144 pages; grades 6-8. 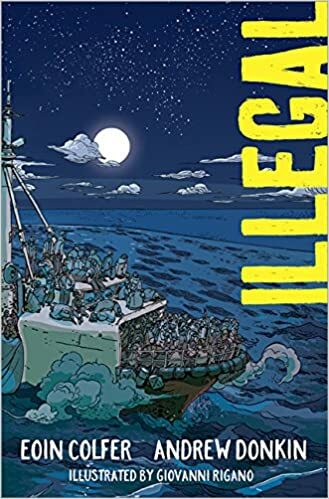 Pros: This graphic novel would make an excellent companion to last year’s Refugee by Alan Gratz. Although Ebo’s story is fictional, the events and hardships seem very real. The artwork is beautiful, with stunning ocean and desert scenes providing sharp contrast to the difficult story line. Cons: While I think older elementary students would find this book engaging and learn a lot from it, be aware there is a lot of death and grief in the story. Summary: When Super Max is called on to stop Doctor Malevolent from stealing a priceless statue from the museum, it seems like business as usual for this slightly narcissistic superhero. 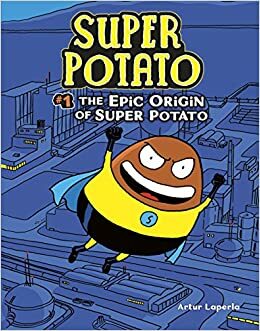 But the evil Malevolent has a new weapon, and before Max can say “Tater Tots”, he has been transformed into a potato with the villain’s ray gun. Fortunately, his superpowers remain intact, so he becomes a flying, extra-strong potato. Much of the story is about his attempts to turn back into a human (or at least get some decent hair), but in the end, his quest is futile, and it appears that he will be fighting crime as a potato in future installments. 54 pages; grades 1-4. Pros: Captain Underpants and Dog Man may have to make some space for this new superhero who will appeal (wildly) to their fan base. Cons: Max’s/Super Potato’s hair (and his obsession with it) reminded me a bit of a shocking head of orange hair that is frequently in the news. Summary: Dani is struggling to make friends in seventh grade after she and her two best friends are put in different classes. When she finds her deceased great aunt’s sketchbook (at a truly dysfunctional family gathering), she soon realizes that it’s magic. When she draws dreamy Prince Neptune’s head (from her favorite comic series), not only does it come to life, but it starts calling her Princess Dani and declaring its love for her. Dani’s next creation is a new best friend named Madison; this situation soon becomes awkward as Madison starts to wonder why her parents have left her in a new town and never call. As Dani tries to figure out how to use her new powers, she begins to make some non-magical friends as well. When Prince Neptune turns out to have an evil plan in mind, Dani’s new friends rally to her side to defeat him. Turns out they all have a bit of magic in them, and there’s a hint of a sequel for these newly minted 7th grade superheroes. 272 pages; grades 3-7. Pros: Fans of Raina Telgemeier, Victoria Jamieson, Jennifer Holm and the rest of the “girl” graphic novel crew will enjoy this new entry. The middle school angst and friendship drama are real, and this one has a bit of the supernatural added. Cons: The battle against Prince Neptune bordered on the absurd. 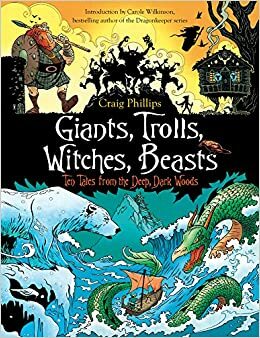 Summary: Each of the ten folktales tells the story of an underdog, often a child or teen, who defeats some sort of a monster…witches, nixies, giants, and other monsters. The introduction describes how folktales were passed down through telling, eventually being published in books which often had few or no illustrations. 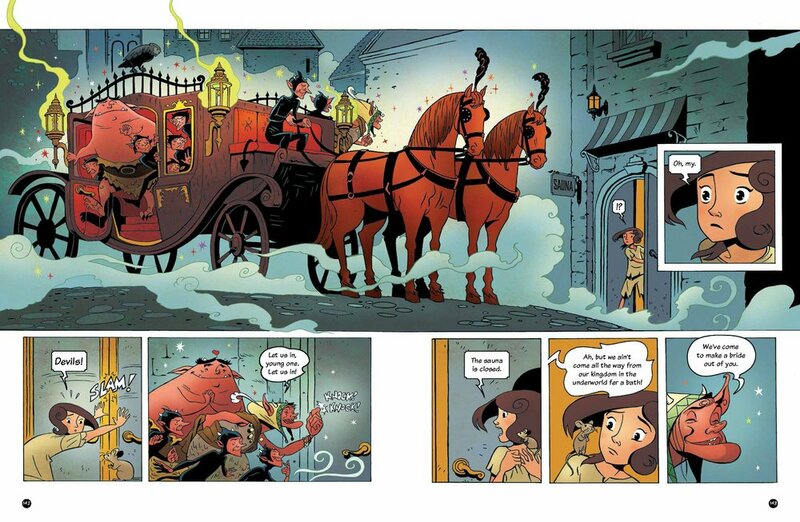 The graphic novel format of this book allows readers to see all the action, characters, and settings that are often from different cultures. The table of contents tells which country each story is from. 192 pages; grades 3-7. Pros: An excellent addition to folktale collections. Kids will love the graphic novel format; the stories are quick reads (15-25 pages with lots of pictures) with beautiful artwork and plenty of action. Cons: It would have been nice to have more cultural diversity. With the exception of “Momotaro” from Japan and “The King of the Polar Bears” from America, all the stories are European. If you would like to buy this book on Amazoon, click here. Summary: New teacher Mr. Wolf has his hands full with 17 lively elementary students…or at least there are 17 until Penny, sleep-deprived from her baby brother’s crying, falls asleep in a box in the library. 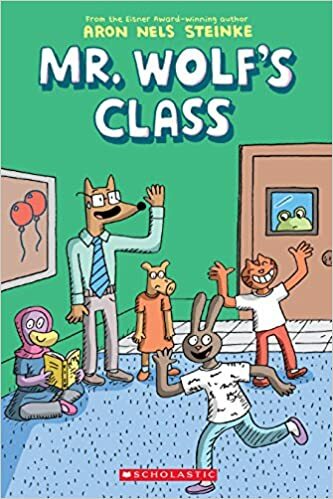 A missing student is only one challenge Mr. Wolf has on his first day of school; he also deals with lunch-eating rats, kids cutting the line, and a boy who spends math time surveying his classmates on whether they prefer ice cream or farts and charting the results on a Venn diagram. Mr. Wolf rises to all occasions, though, and the kids are pretty happy as they head home at the end of the day. Stewart and new girl Margot bond on the bus ride home; Margot comes to the rescue when Stewart leaves his shell collection on the bus, and a new friendship is made. Book #2 (Mystery Club) is due out in February. 160 pages; grades 2-5. Pros: Aron Nels Steinke has clearly spent some time in an elementary school, and I laughed out loud at some of the scenes that will be recognized by most teachers and students. I loved this graphic novel from start to finish, and recommend it as first-day-of-school reading for anyone who will be going back to school in September. Cons: The evil Mr. Mane, a lion teacher who steals Mr. Wolf’s stapler, but then pretends not to have done so with false friendliness. 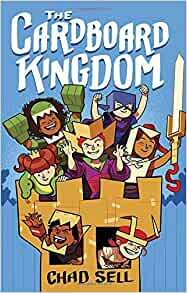 Summary: A neighborhood group of kids plays some pretty complex imaginary games in this graphic novel, aided by their extensive use of cardboard to make costumes and other accessories. Each chapter is written by Chad Sell and another writer, and focuses on a different kid in the group. There’s some gender bending, with the sorceress being played by a boy in a long gown and heels, and a girl in a mustache taking the role of mad scientist. While parents occasionally question these choices, the other kids never do, and there is a satisfying aura of acceptance around the games all summer long. Even the bully is shown to have a difficult home life and is eventually drawn into the fun. At home, kids are dealing with divorce and absent parents, but the camaraderie and joy of play help them to put aside those issues when they don their costumes. 288 pages; grades 4-7. Pros: A celebration of imagination, adventure, and being true to yourself, told in graphic format with a diverse cast of characters and plenty of colorful costumes. Cons: There are a lot of characters to keep track of. Summary: Colby Sharp, co-founder of The Nerdy Book Club, embarked on a creativity project with 44 children’s book authors and illustrators, who were each invited to create two prompts. Mr. Sharp then sent them two prompts from other artists and asked them to create something based on one of them. This book is the result: a collection of poems, stories, artwork, and comics. Each one shows the prompt that was given (and who made it up), followed by the creative work it inspired. The names will be familiar to any fan of children’s literature: Lemony Snicket, Jennifer Holm, Dan Santat, Victoria Jamieson, and many, many more. The final section, entitled “Prompts for You” includes intriguing text and pictures to inspire readers. Includes brief biographies of all the contributors and an index. 288 pages; grades 3-7. 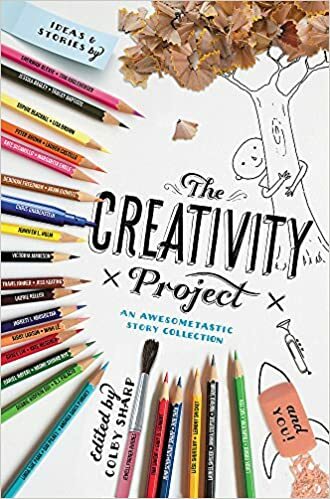 Pros: This unusual book is fun to read (especially for us nerdy children’s book fans) and an inspiring look at the creative process. There were some fun surprises (a deliciously creepy tale by Dav Pilkey comes to mind) and enough different genres to keep things interesting. The prompts at the end will make you want to cast everything else in your life aside and start writing. Cons: It takes some persistence to plow through the whole book, and a few of the entries seemed like the writers kind of phoned it in.